Does God want us fulfilled?Popular psychology says we should be fulfilled. Advertisements tease us with dozens of ways we can be fulfilled. Many preachers and book promise Christian fulfillment.But in this surprising (and surprisingly liberating) book, Craig Barnes suggests we weren't created to be whole or complete. With a fresh reading of the early chapters of Genesis, he says that much of our pain and disillusionment arises from wrong expectations of the gospel and of life.Echoing comedian Bob Newhart, Barnes "would like to make a motion that we face reality." He candidly draws from his own experience as a son, a student, a husband, a father and a pastor to help us see what we all know but are so reluctant to say aloud--that biblical living will not save us from crises or unfulfillment.Barnes writes for anyone who knows that faith must be tough enough to "hold up in the emergency rooms of life." But he doesn't merely help us face reality. He helps us see how our needs and limitations are gifts, the best opportunities we have to receive God's grace. 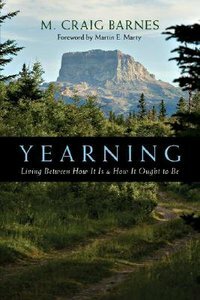 Because of that,Yearningmay be the most honestandthe most helpful book you'll read this year. M. Craig Barnes (Ph.D., University of Chicago) is pastor of Shadyside Presbyterian Church in Pittsburgh, Pennsylvania, and the Robert Meneilly Professor of Pastoral Ministry at Pittsburgh Theological Seminary. For nine years he served as pastor of The National Presbyterian Church in Washington D.C. He has written Yearning, When God Interrupts, Hustling God, Sacred Thirst, Extravagant Mercy, Searching For Home and most recently The Pastor as Minor Poet: Texts and Subtexts in the Ministerial Life.